True or false: fortune cookies originated in the US. If you said false… Gotcha! This trivia game challenges you to sort out the bizarre facts from urban legends. Gotcha! Is a new iPhone app release from the developers at Movisol. You have 15 seconds to answer each question as true or false, and before each question is shown a message appears on the screen that says: “hurry up, this one is easy!” which is a little presumptuous when you are being asked about the Ming Dynasty. The game is scored, and after you’ve finished, you’re placed in a personal or global ranking. Whether you guessed right or wrong, a flash card will appear that explains or elaborates on the fact in question, which is kind of nice instead of just seeing you guessed incorrectly. After playing for a bit, you get the hang of the theme of the game, which is to shock you by stating the most outrageous facts that end up being true. The graphics are cool, and Movisol does a good job giving instructions. You can choose to share your score when you’ve finished via email. The developers paid attention to the details, but the overall concept of the game lacks excitement. Since it’s basically a wikipedia of strange facts, Movisol needs to dig deep to make this app captivating. An online multiplayer gaming feature would do Gotcha! a world of good. This iPhone app is entertaining, but it could be improved. 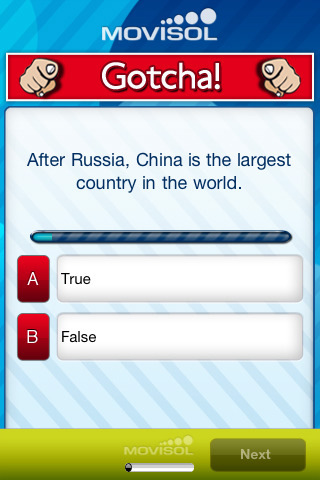 There are sounds when you select a true or false option and when you have finished a round, but there’s no music playing in the background, which makes the game a little boring. Also, it might be more exciting if we were playing for something, or competing with other players or a computer to see who gets the answer right first. It would be nice if there were different levels you could try to reach, instead, all the questions are of the same level of difficulty. If you’re expecting a heart-pumping game to play, Gotcha! wouldn’t be your first choice. You may end up learning some pretty interesting facts about the American space program though. AppSafari review of Gotcha! was written by Amanda McFarland on March 31st, 2010 and categorized under App Store, Education, Games. Page viewed 4098 times, 1 so far today. Need help on using these apps? Please read the Help Page.